AAA Fire Protection Services, the leader in fire protection and suppression products and services is a specialist in kitchen grease exhaust cleaning as well as grease filter exchange services. We’re dependable, highly professional and sensitive to your slower and busier hours. In addition to exhaust cleaning, AAA Fire Protection Services offers the best brands of portable fire extinguishers and cabinets, fire sprinkler system designs and installations, and complete industrial and restaurant fire systems. We pride ourselves on ethics and very fair and affordable pricing. We truly care. For nearly 40 years, we have provided fire protection services for thousands of foodservice and commercial clients. As a family-owned enterprise we have the utmost commitment to the well-being of our Cupertino customers, employees and to the community. 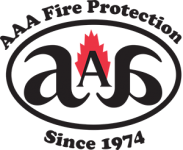 Our pledge is that AAA Fire Protection Services is always here to ensure the safety your Cupertino facility.